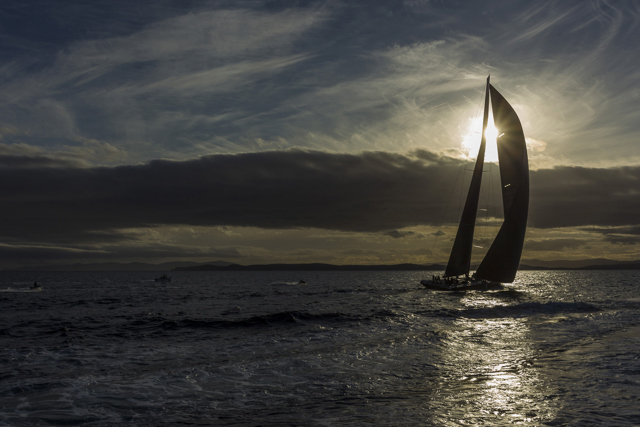 When Comanche crossed the finish line of the Rolex Sydney Hobart Yacht Race at Castray Esplanade in Hobart, Tasmania, at 9:58:30 hours tonight, history was created, because Kristy Clark became the first female owner to take line honours in the blue water classic. Kristy, who raced aboard the yacht while co-owner husband Jim stayed ashore, was thrilled to take line honours in her first foray into the race. While the yacht represents the New York Yacht Club in the USA, Kristy is of course, Australian through-and-through. Jim was on the water to greet the Ken Read skippered Verdier Yacht Design and VPLP yacht as it made its way up the Derwent River to the finish line. It is the first time, possibly with the exception of the early years, that a boat has retired, her crew sail 30 odd nautical miles back towards Sydney, before deciding to continue on racing and go on to win. And the locals loved it. As Comanche zigzagged close to shore, trying to find pressure on the River Derwent, at Blackman’s Bay lights were being flashed on and off from hundreds of houses and those in cars at Blackmans Bay Beach flashed their lights on and off, making an unforgettable impression against the last light of the day. Comanche’s finish was impeded by the breeze which came and went at whim as the yacht rounded the Iron Pot. At one stage she was powering at 15 knots, then down to 8.5 knots. Her finish time of two days eight hours 58 minutes 30 seconds was outside the record of 1 day 18 hours 23 minutes 12 seconds set by Wild Oats XI in 2012. But it did not matter. The last American to take line honours in the Cruising Yacht Club of Australia’s race was Larry Ellison’s Sayonara, 17 years ago in the fatal 1998 race, so Comanche’s efforts was quite some achievement, even if their quest of beating Wild Oats XI was not to be. However, the Oatley family and Wild Oats XI skipper, Mark Richards, were watching back home in Sydney and sent a congratulatory letter to Jim Clark. An updated release, including quotes from the owners and skipper Ken Read, will be sent following the presentation at Constitution Dock.